The history of Friern Barnet is closely linked with the Knights of the Order of St John of Jerusalem who cared for pilgrims and the sick during the Crusades in the 11th and 12th centuries. In 1199 the Knights were given an estate, approximately where Friary Park is now, and it is possible that they built a hospice near where St James Church now stands. At this time the main road to the north ran from Muswell Hill down Colney Hatch Lane (then called Halwykstrete) and along Friern Barnet Lane (Wolkstrete) so a hospice would have provided comfort to travellers. In 1540 the land passed back to the Crown and then to the Dean and Chapter of St Paul’s. The name Barnet means “a place cleared by burning” (the area at this time was very heavily wooded) and the first mention of Frerenbarnet occurred in 1274, presumably referring to the Knights, or “freren”. The name “Friern” is sometimes mispronounced as “free-ern” but in the past the name has variously been spelled as Friarn, Fryarn, Fryarne, Fryarn, Fryern and Frierne. In medieval times the area where Colney Hatch Lane meets Friern Barnet Road was the site of a hamlet known as Colney Hatch (“hatch” being an old term for gate). At the other end of Friern Barnet Road (Betstile Lane) was Betstile (or Betstyle), another small settlement. There was also a small village at Whetstone. Even as late as 1802 there were only 12 houses at Colney Hatch, and the total population of Friern Barnet Parish amounted to only 432. In the 14th century the Bishop of London permitted a road to be driven through his land, to the west of Friern Barnet, and as this was on higher ground it provided a drier and easier route to traffic which had previously been bogged down in the valley of Colney Hatch Lane. The new route was called the King’s Highway (it later came to be known as the Great North Road) and it led to the introduction of inns and stables and trades such as blacksmiths, wheelwrights and carriers in Whetstone. 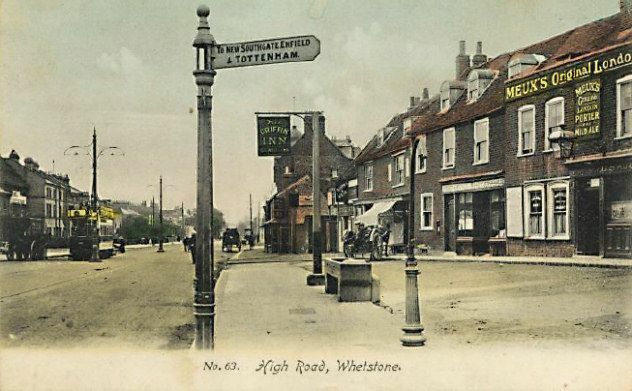 The name Whetstone is sometimes erroneously thought to be derived from the whetstone outside The Griffin however there are early references to “west town” which predate the Battle of Barnet (1471) where soldiers were supposed to have sharpened their swords on the stone; the stone itself probably date from the 1770s. Because the area is comprised of boulder clay, left over from the last Ice Age some 10,000 years ago, hay was the only sustainable crop and this was used to support the horse traffic on the Great North Road and was also used to supply London. Two things led to the growth of Friern Barnet in the 19th century. First was the building of the Great Northern Railway from King’s Cross to the north (now known as the East Coast main line) with a station at New Southgate. The second was the building of the Colney Hatch Pauper Lunatic Asylum in 1851, which provided jobs and commerce. The building of the first Alexandra Palace in 1873 also required a large labour force and many of those lived in The Freehold, to the south of what is now the North Circular Road. However, the biggest spur to population growth in the area was the coming of trams in the early twentieth century. These provided cheap and easy access to London and thus enabled workers to move out from the centre. 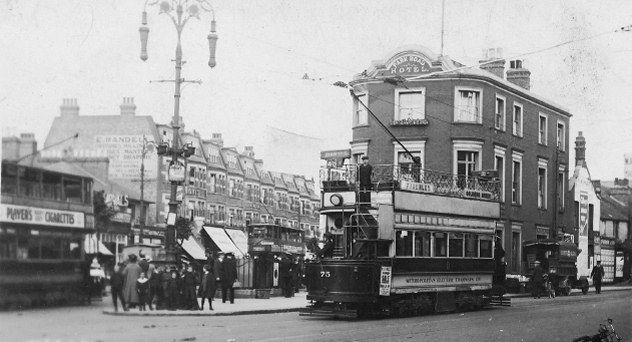 Although trams had reached North Finchley and Whetstone by 1905 via Archway, they did not run along Friern Barnet Road until 1909. In 1851 the population of Friern Barnet was 974, by 1881 it had reached 6,424 (including 2,351 in the Asylum) and in 1911 it was 14,994. It reached its peak in 1961 with 28,813. In the twentieth century the creation of two large factories provided jobs for local people. Standard Telephones and Cables, in Oakleigh Road North, was the largest employer (over 11,000 in its heyday) and John Dale, in Brunswick Park Road, provided many skilled and unskilled jobs.